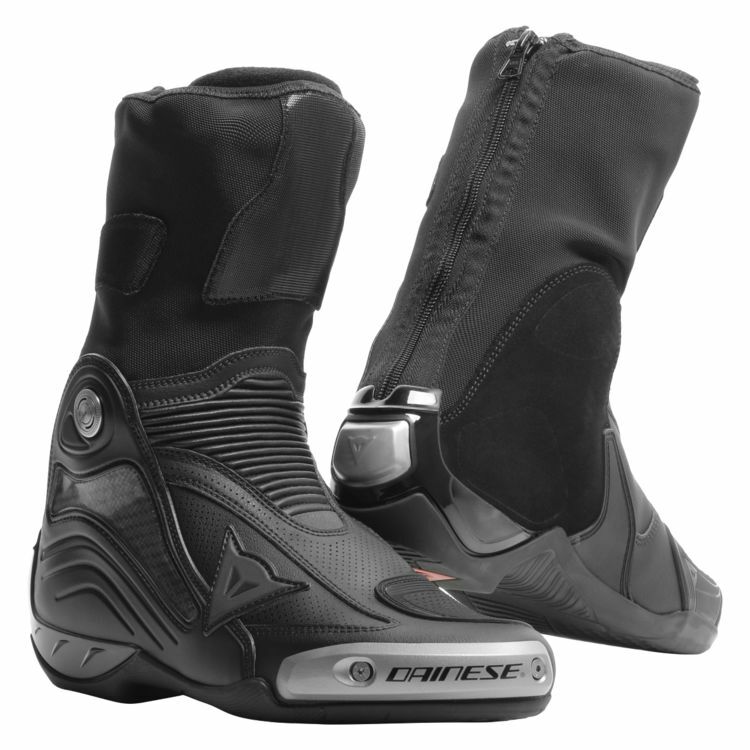 The Dainese Axial D1 Air Boots were purpose built for track performance. Top racers attack international tracks with these bad boys protecting their feet. New Velcro design makes sure these "in-boots" stay securely fastened to the lower portion of Dainese track pants or track suits with the corresponding Velcro. The latest iteration of the Axial D1 uses a redesigned shift guard for even better control and feedback from each shift. The D-Axial system protects your ankle from twisting, impacts and intrusion of foreign objects. Heavy duty D-Stone fabric resists abrasion, breaking and tearing for the ultimate track day boot. Perforated microfiber panels flow air during those scorching hot track days. Perfect sport bike boot. Have tried many others but no comparison. Besides looking great and being very comfortable, the soles now seem to be more resistant to damage by sharp footpegs, at least compared to the Airwalk soles on the older models of this boot. 4 stars out of 5 because of the high MSRP.